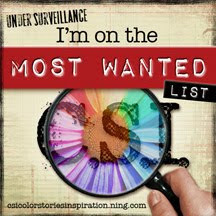 I was SOOOO excited to see earlier in the week that my entry for Case #37 was chosen as one of the 'Most Wanted' layouts. It was such fun to play along that it was just a bonus to have been one of the chosen 5! Tell Your Story. It's our tagline, and here at CSI, it's one of our missions to get our members to delve deeper into journaling--to document the meaningful bits and pieces that make up our lives. We would like to shine a special spotlight each week on a member who did an exceptional job telling their story. Clickhere to see an archive of all our Star Witnesses. Helen's story is so powerful and poignant that her layout was almost unanimously voted on to be Star Witness this week. Helen writes with such strength and compassion that we were transported back to her childhood classroom with her. Our hearts were touched and we wanted to hug little Helen and shake a finger at those teachers. We also admired how artfully she incorporated her journaling into the design of her beautiful page. Helen Wallace is a CSI treasure. Her gift for storytelling takes our breath away. This is what the "S" in CSI is all about. Thank you for sharing another piece of your heart with us, Helen. If you want to see what I did, check out my post here for all the details. WoW! They are all wonderful!! So inspiring! So happy our team voted for you! And so thrilled to have you playing at CSI!